The other day I did a review of The Organic Skin Co.'s Nitty Gritty Almond Seed Exfoliant (https://bit.ly/2Pcn4gy). I gave it a very good review. They also sent me some cosmetics to review and I wanted to review those separately from the skincare as I feel they are a different part of the company and do not have anything to do with the skincare part of the company. This little pot of gold comes in two shades. Rose Gold (the one I tried) and Lunar. Rose Gold is definitely a beautiful golden shade and Lunar is a white shade. For natural makeup this is very good. 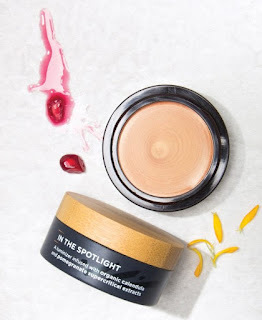 Because it offers satin-shimmer highlights of sheer, buildable color, it can be used over or under makeup to touch-up, highlight, brighten or prime. Can be used as eyeshadow, blush, highlight or lip color. Simply decide which of your features you want to showcase or highlight and then make them 'pop'! It comes in a little pot with a wooden lid and is completely recyclable. 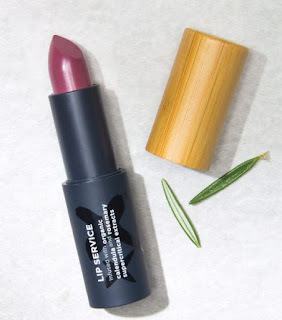 This product is cruelty-free and vegan too! I like this highlighter because it goes on easily and provides a lot of pigment. I like how it wears as a highlighter or eyeshadow. On the models online, it is shown as a highlighter or eyeshadow, and I even wear it on my lips too with my lipstick (in the middle to highlight). This is a very beautiful rose gold shade that I happen to love and is very on trend right now. These little pods of color are great for cheeks and lips. They are considered to be one of the best natural cheek and lip creams that you will find anywhere. 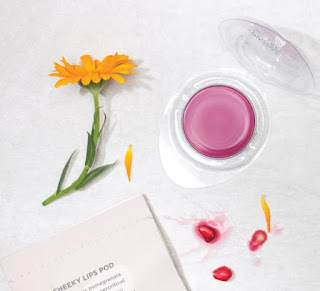 Designed to provide a perfectly natural flush and pout to match, Cheeky Lips not only comes in some bangin' long-lasting colors, it will help to replenish the cheeks and lips, keeping them smooth and nourished with their ingredients. They come in seven shades: Velvet, Lush, Spice, Petal Power, First Blush, Desert Storm and Madras. I tried Spice, a beautiful rosy brown. Cruelty free and vegan. These cheek and lip pods are extremely pigmented and put down a lot of color. You really don't need to apply a lot to get a lot so be careful. These may seem expensive but for what you are getting they are not. These are very good cosmetics that are almost all natural and very well put together. It is not easy to get and make the ingredients for natural cosmetics, put them together in smaller batches and make sure they are up to high standards. Here is a swatch of the Spice shade"
There is one great thing about wearing lipstick, you get to decide your mood. Are you confident? Calm? Exuberant? Excited? Restrained? All you have to do is pick your color and ta da! Offered in twelve shades, Lip Service matches to the moment and cares for your lips as you head out into the world. But this lipstick is definitely safer than the others on the market. This one contains 71% organic ingredients and is cruelty free. Shades are: Arcadian, Bare, Blossom, Coral, Flame, Galaxy, Ruby Red, Spice Bazaar, Star Dust, Summer Sands, Terra and Wisteria. I tried Wisteria, a vivid magenta pink. Although Wisteria is not exactly my favorite color, I wore it with gusto. It came out looking quite nice on me though. Very pigmented color that lasts the day. Well worth the money in my opinion. I think this makeup is definitely hitting its stride and coming out with great products. These cosmetics can be found online at www.theorganicskinco.com. Like The Organic Skin Co. on Facebook: https://www.facebook.com/theorganicskinco; Follow The Organic Skin Co. on Instagram: https://www.instagram.com/theorganicskinco/.